Are you looking for a new plotter in Denver? 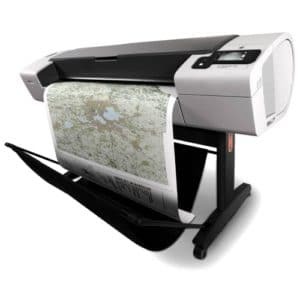 We can help you get a plotter for your business and one of the best things is we also offer used plotters for those looking for a better value. For example, we currently have a HP Designjet T790 plotter for sale with new printheads and inks that are full for just $2500 rather than the $6000 or the $7000 a 44″ color plotter might normally cost. It comes with a cutter installed as well as a stand as is great for engineering drawings. We can deliver this unit for an additional $150. We would love to work with engineering or architectural companies looking for a plotter here in Denver. We have new and used plotters available from a few different brands and there are even extended warranties available. If you are looking for a great deal on a Plotter here in Denver, feel free to give us a call. We have many models available if this plotter doesn’t suit your your team.